While we waited for a weather window, we got to hang out on one of most beautiful beaches in the Turks and Caicos Islands! White sand, clear water, and mostly deserted, what more could you ask for? The weather window finally came after about three weeks of waiting, so we took it. Off to the Dominican Republic, we went. The Turks and Caicos Islands are made up of about 40 islands and cays. (pronounced “keys”) TCI is located just under the Bahamas and east of the island of Hispaniola. (the Dominican Republic and Haiti) The history of the majority of islanders is Bermudan, and slave settlers dating back 300 years. 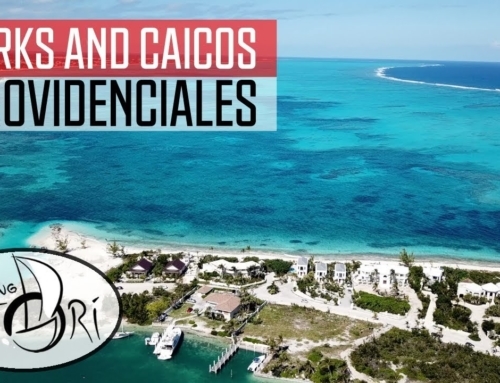 Turks and Caicos immigrant population is an expanding group of Haitians, Dominicans, and Cubans as well as many residents from all over the world. These islands are home to roughly 30,000 residents and welcome more than 200,000 tourists annually. 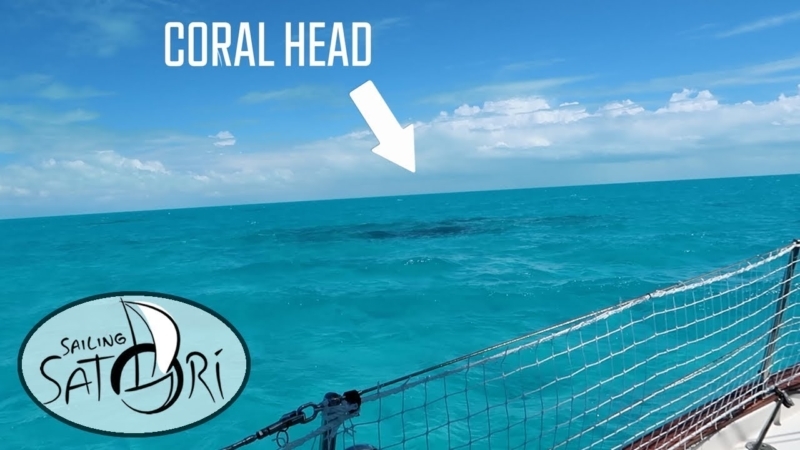 About ten miles into our sail here, crossing the Caicos banks, the wind started off a little calm and as we kind of got away from land it increased a bit. We’ve got about 26 miles to go and we got about 14-15 feet the entire way across this thing. We pretty much get to stay on this tack the entire way which is nice. We just blew past our friends. After about a week at the leeward anchorage, near blue haven resort, we made our way around the island. Our plan is to stage at the Sapodilla Bay Anchorage. This is the go-to staging spot for most boats heading south. There’s a government dock near the Bay where you can clear in and out of Turks. But there is little for amenities on this side of the island. Any provisioning will require a rental car at about $30 a day. It’s far less than the obnoxious $40 taxi rides all around the island. One thing this bay does have is an amazing beach. Just a short dinghy ride west of Sapodilla is the bigger and less crowded Taylor Bay Beach. With little else to do in the area, this became our waiting room for the next weather window. It could be worse. So it’s bright and early the day before our departure. Finally, we get to leave Turks and Caicos. It’s probably pushing three weeks now since we’ve been looking for a weather window. We had a short one and then we had some issues with our brand new alternator that we purchased here. Our friends on Valhalla who we’re sailing with, (I think that’s them right there) they had some issues with their sails so this two and a half day three-day window to get South closed real quick. We have a nice big window opening up tomorrow. That’s our day to cut across the Turk’s banks and we’re doing some last-minute scrambling. We got a car rented and we’re gonna do some errands this morning to get 40 gallons of diesel via jerry cans. Luckily Alex has like three jerry cans on board. They’re full, so I’m gonna empty his into my tank and then probably make two runs to the gas station with the car. That should be plenty… These two I emptied last night at 10 o’clock. 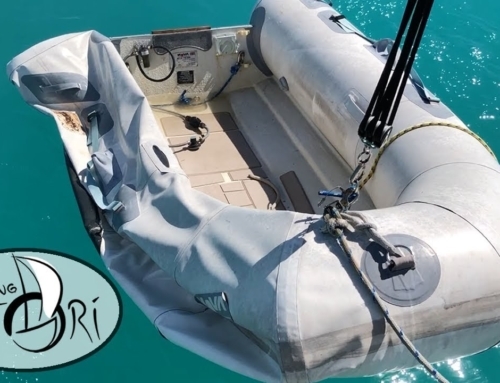 Hey guys we have just released a whole line of sailing Satori gear! Get your swag fix with our one-of-a-kind t-shirt designs, mugs, totes, kids gear, and our original 4k drone prints! Click the link in our description or visit our website now, www.sailingsatori.life. It’s like 6:30 a.m. We are leaving Turks and Caicos today, at least Sapodilla Bay. Here in Provo with one last dinghy to the beach before the light comes out. We are pretty excited as we’ve been here way too long. It’s been like almost a month here in Turks and Caicos which is about three weeks too long. We’ll be our way at sun up. Yay, we’re leaving, well we’re leaving Provo. Choosing a good weather window is important for this passage across the banks. The shallow water can make for a slow and miserable ride when the wind and waves pick up. As we approach our anchorage for the night, coral heads decorate the seabed. Therefore, midday light is also important. Alright, so we’re about ten miles into our sail here crossing the Caicos banks. The wind started off a little calm and as we kind of got away from land it’s increased a bit. We’ve got about 26 miles to go and we got about 14-15 feet the entire way across this thing. We pretty much get to stay on this tack the entire way which is nice. We have a single reef in our main and we have our full jib out. We just blew past our friends. We’re expected to get in about 2:30 which is plenty of time. I might just reef that jib in a little bit just to make it a little easier for us and more comfortable. Compared to what we’ve been seeing, you know these banks aren’t bad. This is a lot like Tampa Bay on a windy day. It’s a little rough for Arthur, so we got him in the bag. I made some coffee and plantains. I didn’t get a picture of the breakfast….Because we inhaled it! Even though the day sail was pleasant, the boat felt sluggish. It was no surprise why… A chore we had put off until it was too late… Fortunately, we had the afternoon to clean the bottom in the crystal-clear waters of Ambergris Key. From ambergris, it’s a short sail over to Big Sand Cay. We had a late morning departure. This will keep the coral heads in sight and an early arrival gives plenty of time for rest before the next day’s overnight sail to Luperon. The next day we took a leisurely 3 p.m. departure. With 18 hours of sailing ahead of us, this ensures a morning arrival. This passage to the Dominican Republic has been known to test even the most experienced sailors. We were fortunate enough to have one of our most peaceful overnight passages yet. Hey guys we need your help! We have some pretty amazing fans and an awesome little pirate ship here but we have room for more onboard. So subscribe now and tell a friend! You can also share us on Facebook and Instagram and keep up with our daily posts as well as our website, www.sailingsatori.life. If you want to see even more from us, visit our Patreon page where you’ll see extra footage and personalized updates. Every effort keeps a little wind in our sails and helps us keep making awesome videos for you guys!